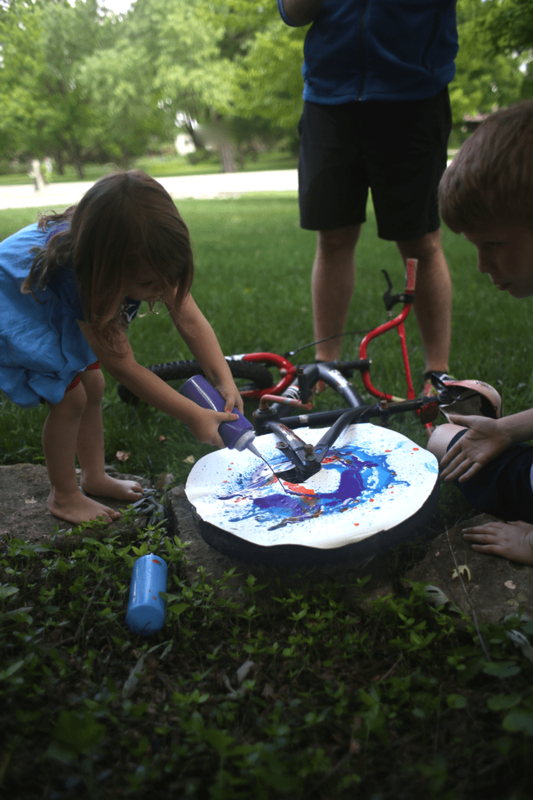 Bicycle Spin Art - I Can Teach My Child! 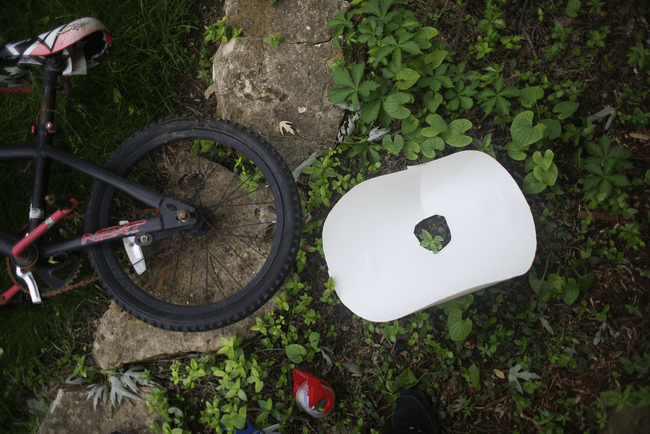 We did this Bicycle Spin Art activity as Day 20 of our 31 Days of Outdoor Activities for Toddlers series, but let me assure you that this is something that kids (and adults) of all ages will LOVE. My boys (7 and 9) were more impressed with this bicycle spin art activity than my 3-year old was! The inspiration for this idea came from Babble Dabble Do but we made our own adaptaptions, like foregoing brushes and spinning the bicycle wheel horizontally rather than vertically. We wanted to create a GIANT spin art machine and I absolutely LOVE LOVE LOVE the end result! 1. 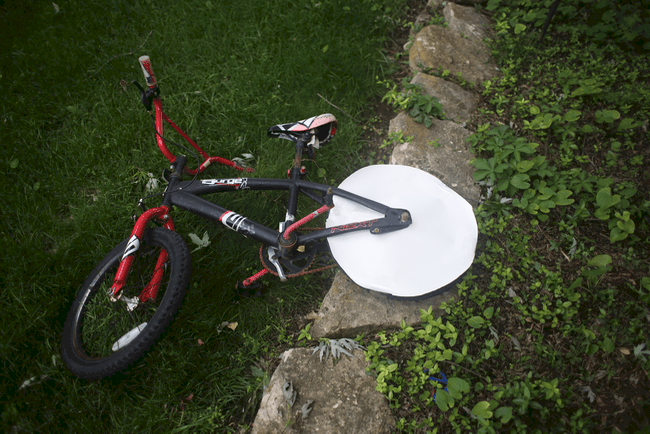 Use your easel paper to cut out a circle just slightly larger than the diameter of your bicycle tire. Cut a hole in the center and a slit to slid it onto the wheel. 2. 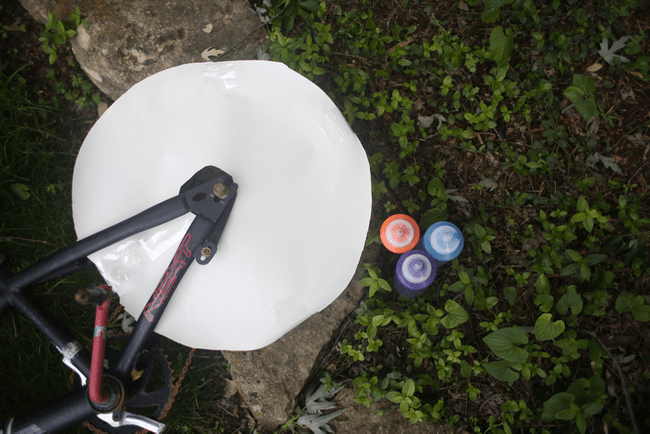 Use your clear packing tape to secure the paper onto the wheel. Make sure the wheel spins with the paper on it before proceeding to the activity. In order for the wheel to spin easily, prop up the bike a few inches. 3. Gather your paint. Pour the paint into squeeze bottles and add just enough water so that the paint comes out easily. 4. You are ready to get started! Have one person spin the wheel while the other squeezes the paint onto the paper. This activity was a family affair! Keep painting…keep spinning! 5. Once all the paint has been applied, have everyone step back and spin the tire as quickly as possible. This is the final step that will give your artwork that “spin art” look! Ta-da! Beware of paint splatters! So. Much. Fun! Gather your kiddos and try it! You will be glad you did!